As the eastern states are pummelled by raging storms and flash floods, Perth is set to swelter through a Christmas-week heatwave. And the rest of summer is expected to be warmer than usual. January to March is expected to make up for the late onset of warmer weather this year. 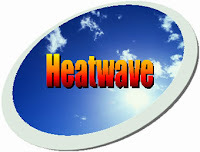 There is more than a 50 per cent chance that this summer will exceed the average median temperature. Perth had endured seven days above 40C in 2007, compared to the average of three days a year. If the temperature again exceeds 40C in the next week, this year will set the record for the most number of very hot days. This heatwave follows several weeks of UNUSUALLY cool weather. In fact, Perth is set to record only its 10th year, since records began in 1897, in which November has been warmer than December. The average temperature so far this month was 24.9C, compared with the December average of 28.8C. November this year was Perth's WARMEST AND SUNNIEST ON RECORD, due primarily to an absence of cold fronts. The average maximum was 28.5C, compared with the historical average of 26.2C. Perth's sunshine stands in stark contrast to the wild weather ravaging Australia's eastern seaboard. Since midnight Friday, a RECORD 171 millimetres of rain has fallen at Coonamble in New South Wales' north-west. There a large number of rural property owners isolated because their roads are washed away or impassable because of heavy rain. 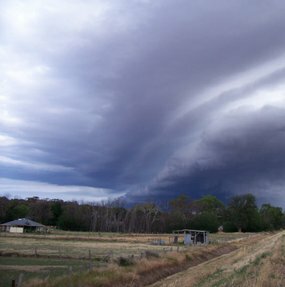 Image: A storm cloud passes over a property in Newstead, Victoria.